And that is why I am back. Well, wanna know what I've been up to while I've been gone? I have been testing the willies out of nineteen of my favorite First Grade friends. DIBELs, sight words, math, you name it, they've done it. And if they haven't done it, they probably should have. Of course having all of this testing to do, I was naturally faced with the age-old teaching dilemma of what to do with the nineteen students I wasn't testing while still managing to maintain a silent classroom for the one student I was testing. I used Cut and Paste friends!!!!!!!!!!!!!!! These little buddies occupy AND assess. Want your own cut and paste friends? Click any picture preview to download. Wishing you a marvelous Monday! OMG! Did anyone ever tell you how amazing you are??? I am glad you are back in the blogging world! Yay! Thanks so much for sharing! These are great! 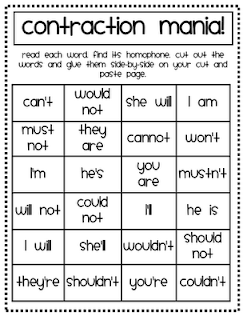 As I was downloading the contraction one, I noticed the directions were for homonyms. Glad you're back! 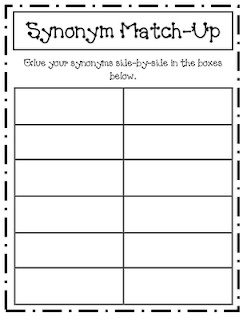 I love these-can't wait to use them next week when our slew of tests start! You are amazing! Thank you sooo much! Thanks so much for sharing, these will be great during DRA's! OMG!!! I love you for these. Thank you soooo much! I just came across your blog and I love your ideas!! (I just added you to my sidebar!) THANK YOU for sharing this! I can definitely use it! *Add to your sidebar if you would like! 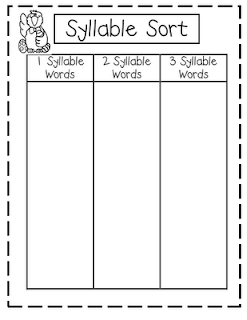 I love your blog and have used several of your activities with my students! The Honk! Honk! riddle game has been a big hit! Thanks for sharing! Thank you so much for sharing your ideas!! LOVE you blog! You are awesome!!! Thank you for sharing! WOO HOO!! Glad you're back! :o) LOVE your stuff! THANK YOU for sharing!!! What a gift!!! These are perfect! Awesome! Last night I was going over my report card rubric and areas I need to assess. This is perfect! Wow! You are so sweet to share with us! OMG!!! I love you!! This is exactly what I needed today. I tried doing centers today while I tested two kids. It was a total flop. Not that we don't do this every single day. But you know how kids just know that you are busy and they can get away with more. I didn't want fluff easter art. This is a perfect review. Thank You!!! I think you've just kept me sane! I've been DREADING DRA testing! Thanks for sharing! Lovin all your cute fonts too! WoW--you are SUPER TEACHER!!!! Love your Blog! These are too cute-fonts & format! You are so generous to offer these for free! Thank you for sharing. 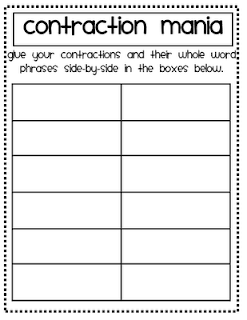 I will definitely be using these in my centers when I get back from Spring Break. These are FANTABULOUS! Yahoo! 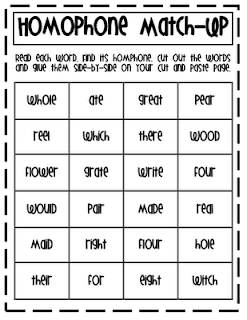 Some great activities for me to print out tomorrow and use with my kiddos! Awesome Job! Thanks so much for all of your hard work! 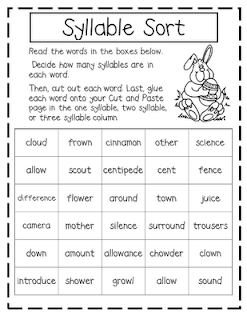 We did the Syllable page today. It was a great review and the kids thought it was lots of fun! Just discovered you and so thankful! I am a first year first grade teacher and I must say THANK YOU!!!!!!!!! Starting up a classroom is so expensive. For you to post your things free of charge is so generous. May your payment be returned with many blessings!!! awesome sight. you were much better than I was my first year teaching! WOW! 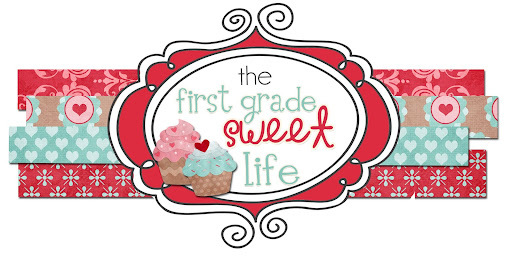 Awesome site and I love the printables. Thanks! Ok, so question for you - what do you use for your testing? Our series offers nothing and our school uses DIBELS but only progress monitors kiddos 3 times a year. I need help with testing - any ideas? THANKS! Life Saver!!! Thanks for sharing! Thank you so much for sharing! I love creating stuff myself, but it's nice to have stuff already there for me. You rock! these are wonderful! thank you! thank you! Hey I love your site!! I love your font what is the name of it? Thanks!! These are wonderful! 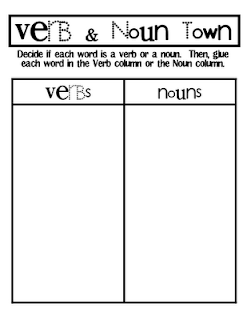 I used them with my students last week and they loved them!! I just found you and can I just say... You are my new favorite person EVER!!! I am proud to say you did the name "Thiessen" PROUD! I found your review little "quizzes" so helpful! Way to go! I love all of your ideas! I am new to blogging, and am loving it so far! Thanks for sharing! These are AWESOME! I'm been using them here and there and again this week. Thank you so much for sharing, You're a life saver! Thanks for the great ideas. While I am wrapping up this year. I now have my summertime homework. I just found your blog and I'm so glad I did! :) Amazing resources! Thanks so much for posting these! I cannot tell you enough how much these saved me during my last days of teaching! They also reinforced skills that we taught that were on our MAP test! LOVED them! Just found these during my summer internet hunt. Thanks so much! I'm moving from middle school to first grade so this will truly help! I am loving what you are doing!!! Keep up the great work! I am guessing you are a fabulous teacher!! Good luck with your new classroom this fall!!! I love cut and paste activities! They are a good time-taker-upper except for one or two kids who always finish in like 2 minutes! But that's why I keep a tub of extra stuff for "When You're Done Early"! They love to dig into that tub! Just found these. Great share ^_^ Thank you! It's been 13 years since I taught first grade, and I got rid of all of my things! Today I was searching the internet for creative games and found you! Thank you for sharing your ideas. I absolutely love them! Thank you for the printables! I made a station using your ideas at my library. Thank you so very much for the cute printables! This is so nice. Your page is so much fun! I love it. I home school my son who is in the 1st grade and you have given me so many ideas! Thank you!! Fabulous cut and paste printables. Thanks for sharing! Thank you soooooooooooo much! These are quite a find! I am having issues downloading these form Google docs. I have tried several times. 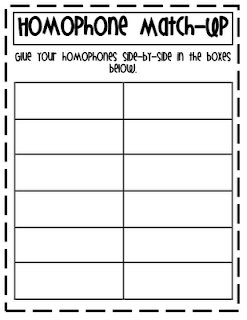 I would really like these worksheets. I don't know if you could just email them to me or see if you can upload them again. Thanks. I love your stuff!!! 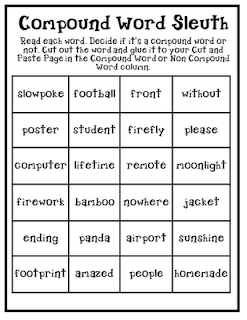 I love the compound word sheets! I am having trouble downloading them as well. It's asking me if the document still exists? Thanks so much for these- just found them through Pinterest. I was needing the compound word page, but it isn't linked. Would it still be available? These are wonderful! I am not a school teacher but I like to work with my kids a lot at home. Thank you so much for sharing these, and for free! You are wonderful! What a blessing. Nice to see someone willing to share for free. Thank you! Thank you. Thank you. Thank you. 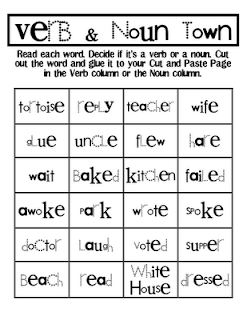 I'm having trouble downloading the compound word activity. 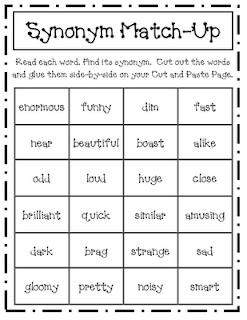 I would love to use this with my class. Can you help? Love all of these activities. Can't wait to use them with my class. The synonym pages wouldn't open though. It said that I needed permission. I would love to be able to use that page with my firsties. Thank you for making so many freebies available. I love the sheets you have. When I click on the sheet it says I do not have access to the page. I was trying to print your Homophone sheet. I just stumbled across your blog tonight while planning for tomorrow and all I can say is "oh my goodness, Thank you so much!!" I don't think I'll ever visit another resource site again!!!! You are amazing and have an amazing heart to share all of this!!!! Thank you again so, so much!!! God Bless!!! Hi there, These look like great practice for tons of skills! 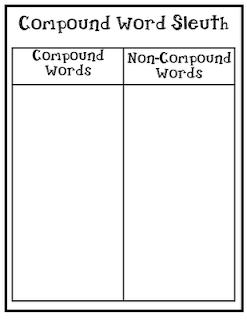 Could you please link the Compound Word pages to a download. They are currently the only set I don't have access to. Thanks much! Amazing!!! Thank you so much for sharing these wonderful activities!!! OH MY Gosh these are perfect!! Thank you so much for sharing, I can hardly wait to use them.